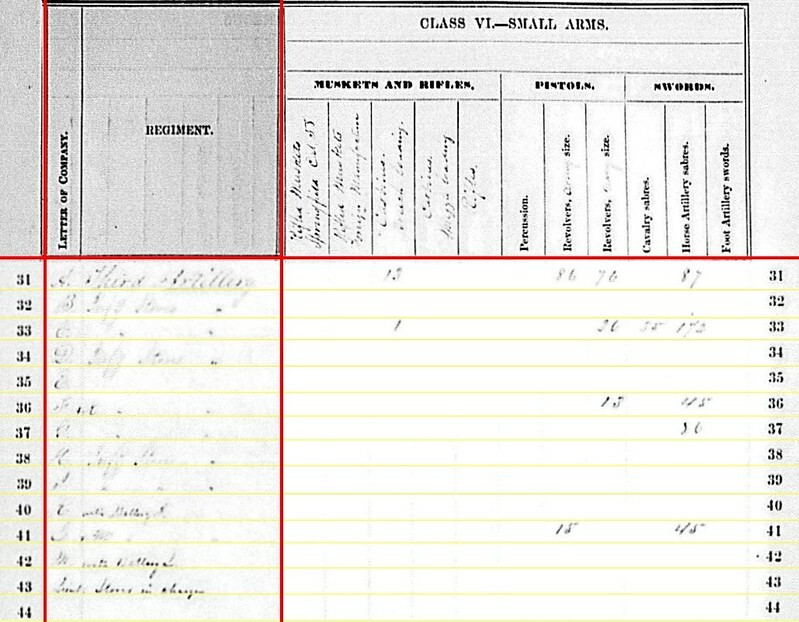 The third installment of the December 31, 1862 Summary Statement, from the Ordnance Returns, is appropriately the Third US Artillery Regiment. Working from past posts on this, I think adding the rule lines makes the presentation better. As with last week, the yellow lines are the left-right rules within the original table. The red lines indicate where I’ve made a “cut and paste” to align header or line labels. But… as I review my work from the other night, I’ve noticed some of my red lines are out of place. At this point I’m not going to tweak them, rather will enforce more quality control going forward. Battery A: No location indicated, but was serving in the Southwest (New Mexico Territory). Two 6-pdr field guns, two 12-pdr field howitzers, and two 3-inch ordnance rifles. Battery B: Fort Point, San Francisco, California. No cannons reported. Battery C: Belle Plain, Virginia. Six 3-inch ordnance rifles. Serving in the Horse Artillery, Army of the Potomac. Battery D: Alcatraz Island, San Francisco, California. No cannons reported. Battery E: No location listed, and apparently no report was filed for the battery for the period. The battery was stationed at Hilton Head, South Carolina. Battery F: Notice the very faint annotation here “<something> with Battery K”. Battery F was attached to Battery K, and stationed at Falmouth, Virginia, assigned to 1st Division, Third Corps. Battery H: Stationed at San Francisco. No cannons reported. Battery I: At Alcatraz Island. No cannons reported. Battery K: At Falmouth, Virginia. Six 12-pdr Napoleons. Assigned to 1st Division, Third Corps, Army of the Potomac. Battery M: Reported two 12-pdr field howitzers and four 10-pdr Parrotts. 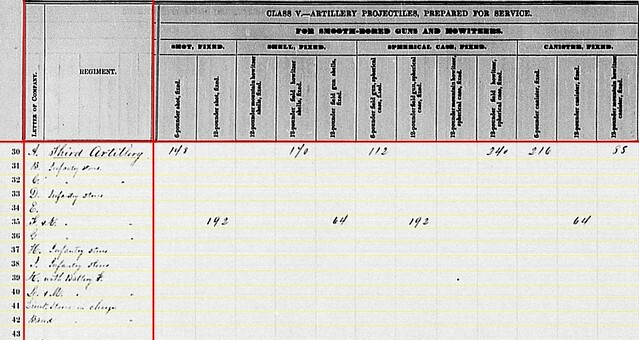 Of note, most sources indicate the howitzers were not used by this combined battery at either Antietam or Fredericksburg. Note also the reporting times indicated on the far left. As mentioned, Battery E did not file a report. And Battery G had disbanded by the reporting time. 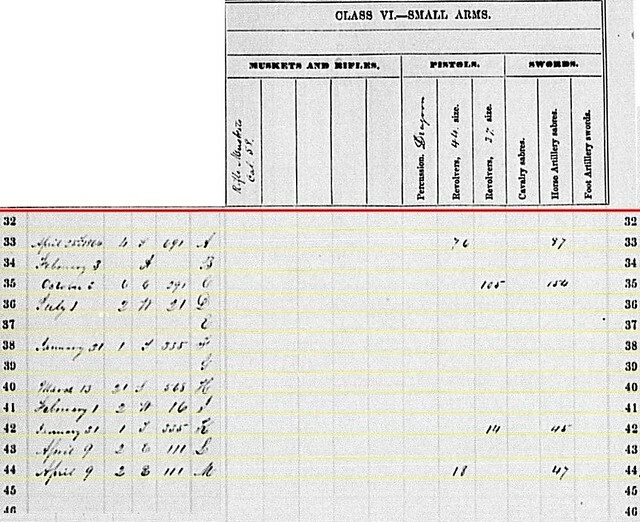 Of the remainder, only five filed reports within the first quarter of 1863. 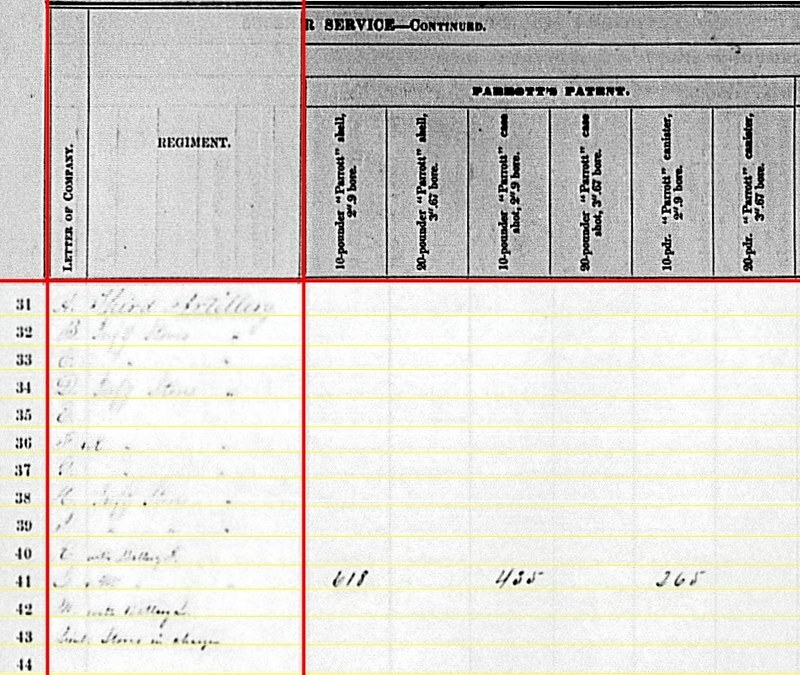 Battery A’s report was not filed until 1864, if I am reading the small notation correctly. Battery A: 458 6-pdr shot, 340 6-pdr case, and 310 6-pdr canister; 430 12-pdr shell, 340 12-pdr case, and 408 12-pdr canister. Battery K: 368 12-pdr shot, 96 12-pdr shell, 198 12-pdr case, and 104 12-pdr canister. Battery M: 118 12-pdr shells, 158 12-pdr case, and 79 12-pdr canister. Battery C: 30 3-inch “canister” and 50 3-inch fuse shell. 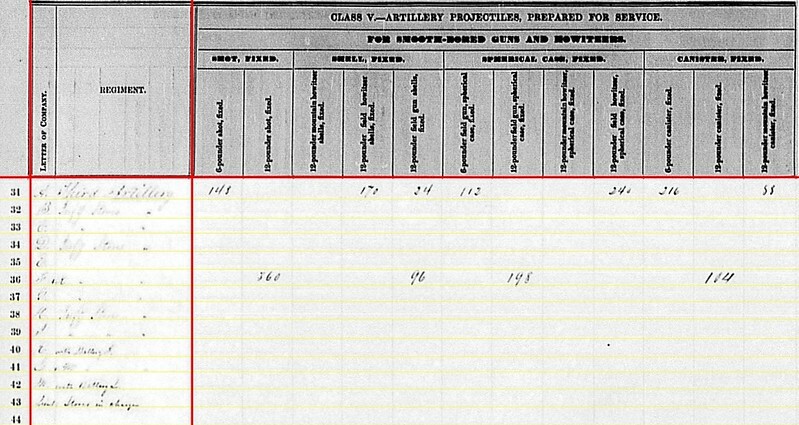 On the right of this snip, notice that Battery M reported it’s quantity of 10-pdr Parrott projectiles – 450 shells, 270 case, and 161 canister. The battery reported 30 3-inch shells and 90 3-inch canister. 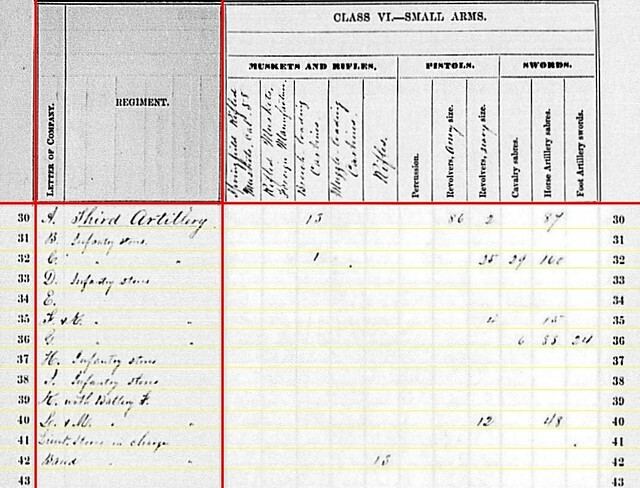 Battery A: 76 .44-caliber revolvers and 87 horse artillery sabers. 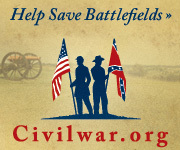 Battery C: 105 .37-caliber revolvers and 154 horse artillery sabers. Battery K: 14 .37-caliber revolvers and 45 horse artillery sabers. 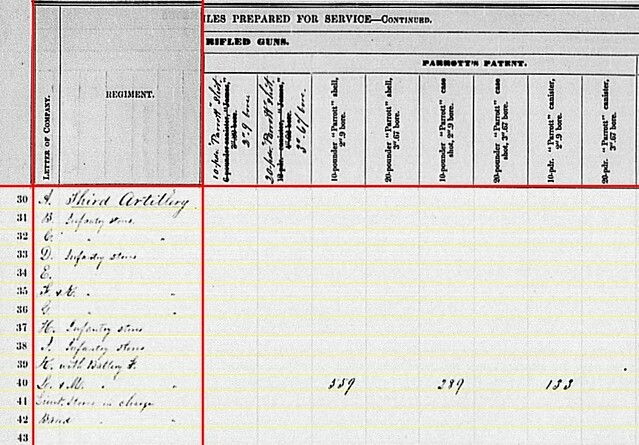 Battery M: 18 .44-caliber revolvers and 47 horse artillery sabers. Perhaps I am worrying about splitting of hairs here, but the .37-caliber, which it is clearly hand-written on the form, revolver causes me pause. Clearly that refers to the Colt or other pattern revolvers in .36-caliber. But I do not see other ordnance department references to .37-caliber. 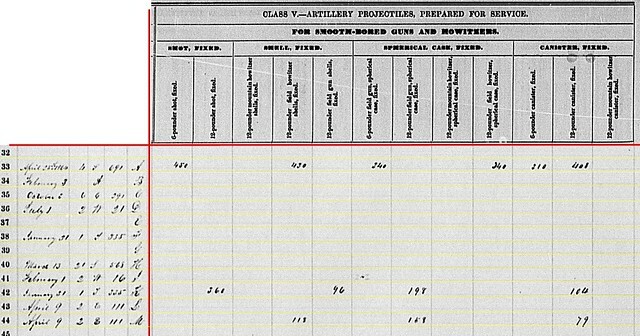 That question aside, the snips above demonstrate the artillery and projectiles assigned to the 3rd Regiment US Artillery at the end of 1862.